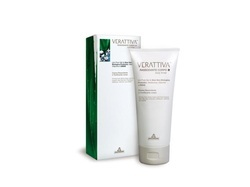 VERATTIVA is a Unique Anti-wrinkle line of products to combat chronological ageing by regenerating the skin with the use of concentrated NATURAL active ingredients. Natural and organic skincare with real results. The results for cosmetic parameters are remarkable from as early as 2 weeks. Increases protection to cells from oxidative stress. Increasing vasco-elastic characteristics and skin hydration. Reduced wrinkles, reduced oiliness and pore size. Reduced inflammation of the skin. A NATURAL product which includes some ORGANIC ingredients and has made the effort to exclude ALL nasties! Firming Cream is part of a specialized line of skin care products. To be applied after shower detergent, this cosmetic is ideal for firming breasts, bottom and legs, due to the presence of DMAE. Daily use makes the body more elastic and toned. IdrAloa =The Aloe utilized is used in the IDRALOE complex,an ideal combination of anti-oxidant vitamin esters, niacin, pathenol and wheat micro peptides. Probiofactor : the combination of probiotics, prebiotics and vitamins promotes the formation of a perfect protective barrier,making the skin more elastic and slowing the ageing process. Wheat micro Peptides:very small proteic fractions which are able to permeate and rebalance skins connective tissue. Especially indicated for hydrating of tired and stressed skin, and to protect the skin from the signs of ageing efficaciously. Made with a concentrate of very high quality raw materials to guarantee vitality and well-being and skin that is ever younger, fresher and luminous. Especially indicated for nourishing and revitalizing of skin to bring back its natural physiological balance. Formulated from important and very high quality nutrients, it is useful in promoting renewal and elasticity of skin during the night, a moment when cell metabolism is particularly active. An ideal treatment for firming and regenerating of skin on face, neck and chest to slow down signs of ageing. Formulated with a concentrate of very high quality raw materials to guarantee strong anti-ageing action. Especially indicated for the reduction of skin problems around the eyes (bags and wrinkles). Made with a concentrated of very high quality active substances to guarantee strong anti-ageing action. With ORGANIC ALOE VERA, PROBIOTICS, AÇAI, HIBISCUS EXTRACT with BOTOX-LIKE action. VERATTIVA EXPRESSION WRINKLE FILLER is an innovative treatment, ideal for slowing down signs of ageing (expression lines, particularly deep ones around the eyes, lips, forehead and neck). Due to the synergy of its revolutionary active principles, it provides youth and vitality to skin by carrying out a strong anti-ageing action. VERATTIVA MICELLAR SOLUTION is an innovative treatment ideal for daily cleansing of face. Efficaciously removes impurities, make-up and pollutants. Due to its blend of delicate natural active substances and the presence of hyaluronic acid, it guarantee delicate and deep down cleansing, while also providing superior anti-ageing action at the same time. VERATTIVA SOAP is an ideal daily cleanser for face skin that respects its natural equilibrium. Due to its blend of natural delicate tension-actives from coconut and sunflower it guarantees deep cleaning to leave the skin particularly soft and hydrating. Water Resistant: Tanning milk with a low filter (factor 2) formulated to promote tanning and bring out a healthy glow and good colour to already tanned skin. Contains vitamins with anti-oxidative and anti-radical properties, such as stabilized Vitamin C and Vitamin E, to ensure an efficacious shield against ageing substances produced by the sun’s rays. Instructions: Apply evenly over skin before exposure to sun. Re-applying product often during exposure darkens tan.